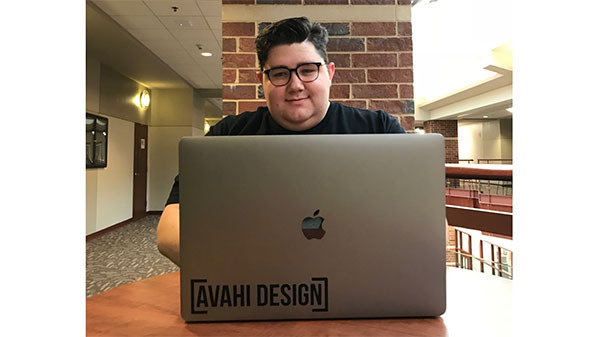 Senior Kris Risner started a graphic design company, Avahi Design, in the beginning of 2018. Lindenwood student Kris Risner didn’t wait until graduation to do what many can only dream about — owning his own business. Risner, 21, is majoring in interactive media and web design at Lindenwood and will graduate this December. Even though he said he initially wanted to major in photography, Risner found himself drawn to web and graphic design and decided to follow that path. At the beginning of 2018, after a few months of paperwork and city hall meetings, he officially started Avahi Design. The company is located in St. Louis and specializes in web design, graphic design, marketing and social media. Logan Friend, a classmate and a friend of Risner, said it’s rare to know someone who went from studying at school to opening a business legally. Risner said he found his Web Design class and an internship with The Firm to be most helpful to his career. The Firm provided valuable experience like how to talk to and work with clients. According to statistics on startup businesses published by Small Business Trends, only 16 percent are owned by people 35 years old or less. But that didn’t stop Risner. Dominic Hoscher and Jack Leach debate some of the popular topics in all of professional sports in unscripted coverage of “The Booth Review.” In the fifth episode, Jack and Dom give their midseason Super Bowl picks, their predictions on where the top free agents in baseball will land, and discuss Le’Veon Bell’s holdout.